Having made a real mess of qualifying and the race at Monza, the McLaren team was hoping to have a rather better time at the Luxembourg Grand Prix but the cars did not perform well in qualifying and Mika Hakkinen found himself behind both Michael Schumacher and Eddie Irvine in the two Ferraris. Hakkinen tried to disguise his disappointment but there was no doubting that he was around a second a lap slower than he should have been and six-tenths behind Schumacher. David Coulthard was in even worse trouble, lining up fifth on the grid behind Giancarlo Fisichella's Benetton, which was behaving very well on its Bridgestone tyres. Behind Fisichella was Ralf Schumacher's Jordan and Heinz-Harald Frentzen in his Williams. When the race began Schumacher made his customary bad start and so it was Irvine who led into the first corner with the two McLarens giving chase and Fisichella under threat from Alexander Wurz, up from eighth on the grid. Irvine's moment of glory was short-lived. At the end of the first lap he made a mistake at the chicane, bounced wide and in a flash Schumacher was through and into the lead. With Irvine holding up Hakkinen Michael was then able to build up a lead of five seconds. After 14 laps running behind Irvine Hakkinen made his move at the chicane and eased ahead of the Ulsterman. Mika then set off after Schumacher and closed rapidly. When Schumacher pitted Hakkinen put on a burst of speed until his stop four laps later. He emerged just ahead of the Ferrari. Further back Coulthard was able to get ahead of Irvine, leaving the second Ferrari to fight for fourth place with Frentzen's Williams. For 10 laps Hakkinen and Schumacher duelled but gradually the Finn began to edge away from the Ferrari. The order was unchanged at the second pits stops and Hakkinen maintained a comfortable five second lead until the closing laps when he let Schumacher close. 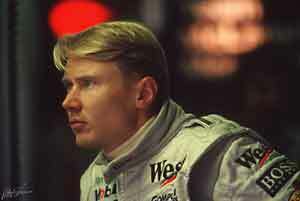 Hakkinen was back as the favorite to win the title. By finishing third Coulthard moved McLaren to within one point of the Constructors' title.